By now, lots of folks in the technology industry, and especially those folks working on the Microsoft stack, are aware of Office 365. It’s a platform for collaboration and productivity and is expanding like crazy. For most for-profit companies, it’s also very affordable. However, what about all of the organizations that are not-for-profit? Many of those organizations are doing the most important work in the world, yet are operating on such a shoestring budget that they can’t afford any paid employees, let alone spend money on any kind of technology. Can they use tools like Office 365 as well? Microsoft is whole-heartedly dedicated to giving back to the community and helping to take care of folks that need help the most. In fact, internally at Microsoft, there’s a huge focus on giving back to the community, including the ‘Give Campaign’ that runs through the month of October each year. 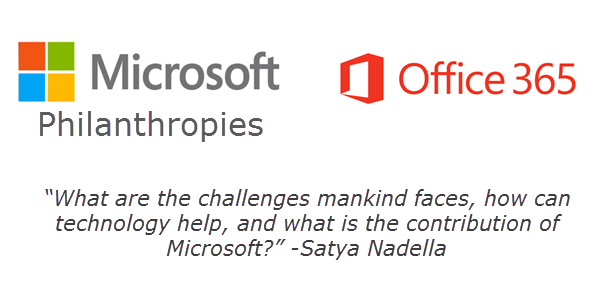 As part of Microsoft’s dedication to the community, we also give away Office 365 to non-profits. Microsoft offers five versions of Office 365 to non-profits, two of which (Business Essentials and E1) are completely free. The other three versions have a substantial discount (more on versions for non-profits here: https://products.office.com/en-us/nonprofit/office-365-nonprofit-plans-and-pricing). Don’t think that this is some stripped down version of Office 365, either. Nope. It comes with the same feature set that would exist if the organization was paying full price. This is the real deal. Additionally, to support user management, Office 365 comes with Azure and all of the Azure features. By paying really close attention and being careful to development methods, the organization can also utilize the free websites within Azure to build additional custom features at no charge. In fact, I’ve been working with a non-profit lately that supports approximately 6,000 users on less than $5 per month (and that’s only because they pay for a Basic SQL database in Azure). Microsoft has created a new Microsoft Philanthropies division (https://www.microsoft.com/about/philanthropies/) that is focused on continued giving to communities around the world. They’ve already begun focused efforts to donate and/or reduce the prices of other cloud services, including Dynamics, Azure, Enterprise Mobility, and more. In January of this year (2016), Satya Nadella (Microsoft’s CEO) announced that Microsoft is striving to give away $1 billion (yes, billion, with a ‘b’) worth of cloud services to over 70,000 organizations. That announcement is a very big deal, as it will open doors that have never been available to non-profits before. I’ve been working in the non-profit space for the past couple years and would love to help facilitate your non-profit’s utilization of Office 365. Feel free to ping me (contact info on my About Me page: https://www.jonathanhuss.com/about-me/) and let’s see how we can help your organization move forward.